This recipe was developed from a sour dough recipe designed for conventional home ovens. It now creates a beautiful delicious sour dough bread in you Solar Oven. ¼ cup of white flour sour dough starter. 1 ¼ cup of filtered water. Place all your dry ingredients into a mixing bowl, stir together. Stir the sour dough starters into the water and then mix the water into the dry ingredients. Place the mixing bowl into a plastic bag and close tightly. Place in a warm area to proof for 6 hours. Once the dough has proofed place the dough on to a floured surface and flour your hands as dough should be very wet and sticky. Gently with your fingers spread the dough out into a circle about ¾ of an inch thick. Fold it over in thirds. Then fold it again in half. Let sit under a towel for about 15 minutes. Mean while spray oil into a mixing bowl and cover with wheat bran. Dump out the excess bran. This will prevent the dough from sticking to the bowl during the final proofing. Once the dough has sat for the 15 minutes flour your hands and gently shape into a ball and place into the bowl. Once again cover with a plastic bag and let proof for one hour. This is a good time to start warming your solar oven. Once the hour is up gently turn the mixing bowl over and guide the dough into a round oiled bread pan. Bake for one and a half hours. The breads core temp should reach 200 degrees. Let cool for a couple of hours and you have fresh sour dough bread. Thank you again Dennis for an excellent solar oven sourdough bread recipe. Thanks very much for the recipe and video. I've been experimenting with the Artisan Bread in 5 min. a day concept, and this seems like a great amalgamation of no-knead sourdough bread and SOLAR COOKING !! Fantastic! The question I had was if instead of rising the bread in a separate bowl and then transferring to the cook pot, if it might just save a step and another dirty dish to raise the bread in the porcelain cooker. When I do this in a conventional oven I preheat a dutch oven and then transfer risen dough to the hot pot which gives a different result because of the markedly different temps involved, but handling the hot vessels is a bit of an issue, and if you aren't careful as to how you transfer the dough it can seriously collapse. It just seemed a perhaps unnecessary separate step, but I would like your feedback - maybe there is an extremely good reason for it that seems to be eluding me. Anyway, I tried a compromise test run with an enameled steel pot and my conventional oven since we still were having cold weather in the mountains, and set the pot on a preheated pizza baking stone in the hot oven after the bread rose - it was much easier than dealing with a hot dutch oven and lid, and transferring the bowl of dough. 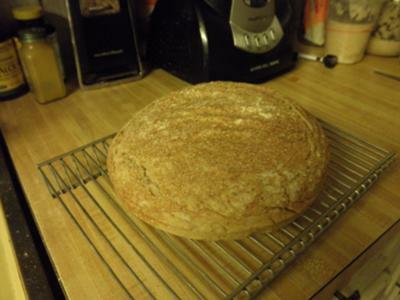 It didn't achieve the same crust crackle as with the other method, but it was still a perfectly lovely loaf. I used your recipe, was very happy with the demo, and appreciate your sharing your methods, expertise and inspiration. Thanks !! Jan T.
P.S More food for thought, maybe - when I revitalize my starter I use a basic ratio of new water 2-3 cups depending on how much bread I intend to make, with enough flour added to get the right consistency, and then I add my stored starter to the bowl, let sit 8-12 hours (or on occasion 24-36), return some of the newly activated starter to the holding pot, and then just mix in more flour, salt, molasses, etc. to the already fermented sponge to get the dough to proper consistency. This might shave off some of the proofing time, or the 4AM bread marathons - although you are probably an early bird anyway. I'm not so much, but I'm sure the method suits your situation because it is an obvious success and keeper. Best of luck, and thanks again ! Thanks for the recipe and the video. I can't wait to try making my own solar sourdough bread!!! Solar Cooking forces you to slow down and focus on your natural surroundings. I think Dennis mentioned how solar cooking is a great excuse to get outdoors, and that's a great point to be made. Thanks for this recipe, and I will certainly try it this weekend, weather permitting.